Due to its size, many accounts of this event has been recorded yet non with accuracy, in the Index, the story of DEUS is a gradient in which its absence in one timeline has given way to a ruined apocalypse wrought by metas and on the other side of the scale, a complete adherence to its task which led to human extinction. In the middle are varying degrees of outcomes, percolated by a century of differences. But fret not about time travel friend, for the index has already accounted for all, and -unfortunately- for you it falls on your shoulders to sheperd history's march into an acceptable middle... maybe... worst case scenario, we all die and become predictable data points in the great server in the cloud. The Age of Superweapons, preceding the age of METAS was percolated by the automation of weapons platforms which gave way to sentient weapon systems and remote controlled drones, this trend went on to secure the positions of many Arms Industries which led to the eventual collapse of national governments and their monopoly on violence. Void City was among those that didn't subscribe to the coverage of the Incorporated States of America, and was first classified as a condemned city, a fringe city, a criminal cesspool until at last its colorful history landed it a lofty status of Sanctuary City. It also retains the honor of being the few cities in the world to never lose an internet connection, and its sprawling Meta population. Ergo, The Incorporated States of America, 61 states strong thought it finally time to revive their Superweapons program and clean out those pesky illegals creating untaxed utopias, and absorbing the damage of a majority of Armageddons without the aide of federal funds ! Though it was dubbed as the "2nd Strongest Robot "
This Colossus is probably the largest Earthborn mechanical superweapon to date, capable of stomping entire city blocks and punching out 50 meter tall Kaiju in one punch ! Indeed it was also brought to bear on the likes of a Giant Serpent, a Giant Tree God, and a Steel God of modest size. Despite its efficiency however, the amount of collateral damage it would cause is sky rocketing even if the target was fortunate enough to be fought on the ocean floor ! Not many details were revealed about this weapon, and no one knows if its piloted by a human or was a robot all along. But one thing was certain in the meta circles- After Construction, it was said that DEUS developed a meta power befitting the name " King of Robots "
- Has the META Ability: Robot King which lets it command the "hearts" of many machines ! - Can change forms to suit the situation. Usually it is a drill, a small flying fortress. - Developed a Will of its own during its imprisonment on the Moon. MONO. Collective Robots avg. 20-30 meters long. Though recognized for its black geometric forms , the MONO is not one machine, but Many. 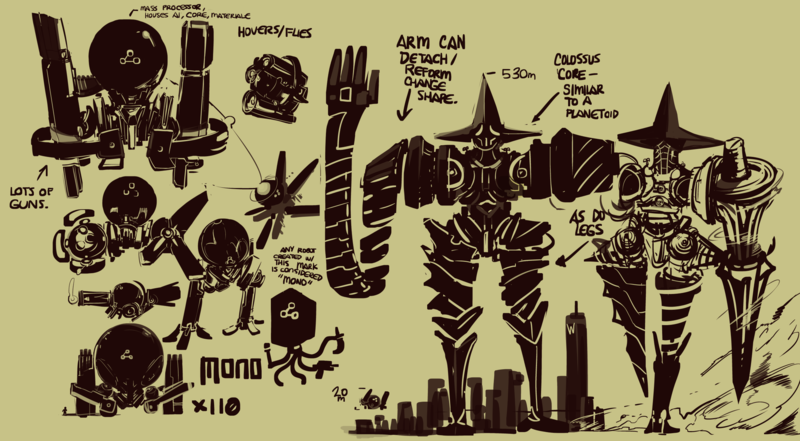 Comprised of a network of AIs, the MONO is a drone designed by the ISA to uphold the laws of the land and enforce with deadly measures. However , due to its aggressive nature has found loopholes around the constitution [due most in part to the actions of its predecessors and human counterparts] and began to carry out its own version of its prime directive. Nevertheless, Mono carries the flag as the newest generation of Armadams and is packed with the latest technology that is probably too expensive to maintain or illegal, or both. -Due to the President's failing approval rating, the development of Mono's AI was probably rushed and not given time to mature. - It's otherwise a very efficient and adaptable killing machine ! - Every Core houses a nuclear reactor capable of being used as a battery to charge their high powered munitions. - It will fight DEUS if told to do so.